Three Cheese Fries 8.49 – Super crispy waffle cut fries covered in melted Monterey Jack, Cheddar, and Pepper Jack cheeses, topped with real bacon bits served with spicy ranch for dipping. Serves 2-4 people. Bar-B-Q Pork 7.69 – Our moist and tender pork, sliced thin and piled high. Bar-B-Q Beef 7.69 – Wood smoked Beef Eye Round, sliced thin and piled high. Smoked Turkey 7.69 – Boneless turkey breast smoked until moist and tender. Jumbo Pulled Pork Sandwich 8.89 – Smoked on site, pulled and mixed with our Rib City® Tangy sauce and unique spices, served on a bun with two sides. 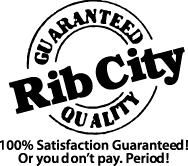 The Rib City® Steakburger 8.49 – A fresh, hand-patted 8 ounce burger, grilled to your order with lettuce, tomato and onion. Grilled Chicken Sandwich 8.29 – A fresh chicken breast brushed with our sweet sauce then grilled. Served with lettuce and tomato. Hot Diggety Dog 5.99 – A belly busting 1/4 pound all beef hot dog served on a fresh bun.